In my last column I discussed an apparent paradox: why, if solar panels and wind turbines are so cheap, do they appear to be making electricity so expensive? New transmission lines can make electricity cheaper, but not when they are used only part of the time and duplicate rather than replace current equipment. Other readers pointed to cases that appear to challenge the claim that increased solar and wind deployments increase electricity prices. In North Dakota, electricity prices rose 40 percent while electricity from solar and wind grew from nine to 27 percent between 2009 and 2017. In South Dakota, electricity prices rose 34 percent while electricity from solar and wind grew from five to 30 percent between 2009 and 2017. In Kansas, electricity prices rose 33 percent while electricity from solar and wind grew from six to 36 percent between 2009 and 2017. In Iowa, electricity prices rose 21 percent while electricity from solar and wind grew from 14 to 37 percent between 2009 and 2017. In Oklahoma, electricity prices rose 18 percent while electricity from solar and wind grew from four to 32 percent between 2009 and 2017. What about Hawaii, California, and Nevada — states that, Hanger noted, “have 10% solar or more”? In Hawaii, electricity prices rose 23 percent, while electricity from solar and wind grew from 3 to 18 percent between 2009 and 2017. In California, electricity prices rose 22 percent, while electricity from solar and wind grew from 3 to 23 percent between 2009 and 2017. Does that mean that deploying solar and wind at-scale always and everywhere increases electricity prices? No. In some cases, the high cost that unreliable solar and wind impose on the electrical grid are offset by much larger declines in the price of other fuels, namely natural gas. Texas and Nevada are two cases in point. In Texas, electricity retail prices fell 14 percent, while electricity from solar and wind grew from 5 to 15 percent between 2009 and 2017. In Nevada, electricity prices fell 15 percent while electricity from solar and wind grew from 1 to 12 percent, between 2009 and 2017. However, it is neither remarkable that there are outlier states nor that they are Texas and Nevada. Many factors beyond the relative reliability of a power plant determine electricity prices. We have been discussing the big ones, which include but are not limited to the addition of new solar and wind and the costs they impose due to their unreliability. Texas, for example, is the epicenter of the fracking revolution. Between 2009 and 2017, natural gas prices for Texas power plants fell 21 percent and wholesale electricity prices fell 21 percent. Texas energy experts point to the way the way Texas electricity market is structured, which has allowed some high-profile bankruptcies of natural gas generators, and a re-tightening of supply last year. Meanwhile, solar plants in Nevada are, like those in California, the most efficient in the nation, producing electricity at whopping 30 percent of its rated capacity. By contrast, solar in New Jersey has a “capacity factor” of just 12 percent. Nevada thus benefited more from cheaper gas and high solar capacity factors than relatively modest amount of intermittent solar in an extremely sunny climate. Integrating solar on to the grid is much easier when to do when you can easily turn natural gas plants up and down to accommodate their intermittency. And it’s much easier to do when it is 12 percent of your electricity instead of 20 percent. But even at low levels, problems arise. According to the research done by Lion Hirth, solar’s value drops by 50 percent when it gets to just 15 percent of mix. While those values may be different for Nevada, the impact of unreliability is the same. What is most remarkable about U.S. states heavy in solar and wind is that electricity prices rose so much given the huge decline in natural gas prices. Had natural gas prices not plummeted at what was almost the exact same time as the beginning of the large-scale build-out of solar and wind in the United States, price increases in solar and wind heavy states would have been far larger. Around the world, from Germany and Denmark to Spain and South Australia, even modest penetrations of solar and wind, compared to what advocates claim we will need to decarbonize, lead to large price increases. Consider Spain. Its electricity prices were below the European average in 2009. Today they are among the highest in Europe. There is little debate in Spain that this was a result of adding so much solar and wind, which led the government to cut subsidies. Some readers suggested that the contribution of solar and wind to high electricity prices was a legacy of older, more expensive projects, and implied that rising solar and wind penetrations would decline in the future. This thinking requires ignoring both physics and economics. The value of solar and wind decline in economic value as they become larger shares of the electricity grid for physical reasons. They produce too much energy when societies don’t need it and not enough energy when they do. This problem is temporarily fixed through short-term (but still expensive) work-arounds — like California and Germany paying their neighbors to take their excess electricity. But the more solar and wind are added, the problem is worsened, not improved, which is why the economic value of solar and wind decline as they become a larger part of the grid. Moreover, we can see that in places like Germany, which is now procuring solar and wind at their supposed rock-bottom prices, is still paying massively more for electricity. Germany spent 24.3 billion euros above market electricity prices in 2017 for its renewable energy feed-in tariffs. For example, solar and wind farms require at least an order of magnitude more land than non-renewable plants. A single example dramatically illustrates the difference. 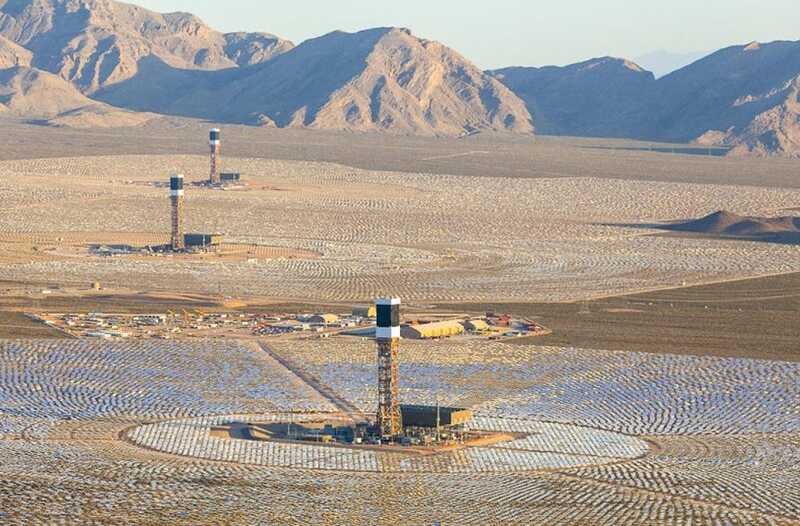 California’s Ivanpah solar farm produces 18 times less electricity on more than 290 times more land than Diablo Canyon nuclear plant. This reality could, along with new transmission, be a significant additional driver of higher costs, now and in the future. The cost of land and expensive new transmission lines can be eliminated if you have solar on your roof, note solar developers, but the savings on transmission are more than cancelled out by higher installation costs. What all of these additional costs have in common is that they stem directly from underlying physical limits with generating electricity from sunlight and wind. Both “fuels” are dilute and unreliable. To make up for those inherent weaknesses, expanding energy from solar panels and wind turbines requires massively increasing the physical footprint of energy production. Renewables require the use of vastly more land, longer and less-utilized transmission lines, and large amounts of storage whether from lithium batteries, new dams, compressed air caverns. 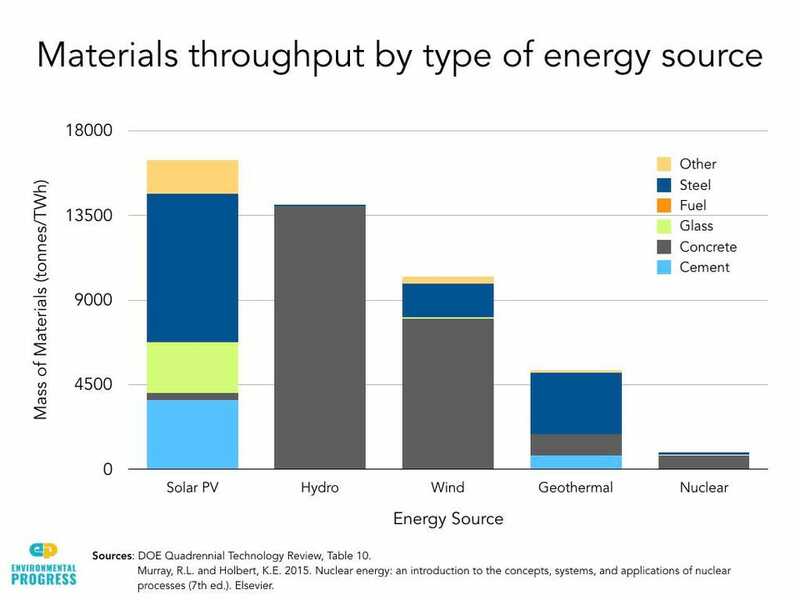 All renewables thus require a material throughput — from mining to processing to installing to disposing of the materials later as waste — that is orders of magnitude larger than for non-renewable energy sources. As such, while there is and will remain complexity and uncertainty about the specific causes of why solar and wind make electricity expensive, most if not all stem from their underlying physical and (thus environmental constraint), which is the limited, diffuse, dilute, and unreliable nature of renewable fuels. And that’s something we need to talk about — and deal with — if we are to protect the natural environment while expanding prosperity to all.